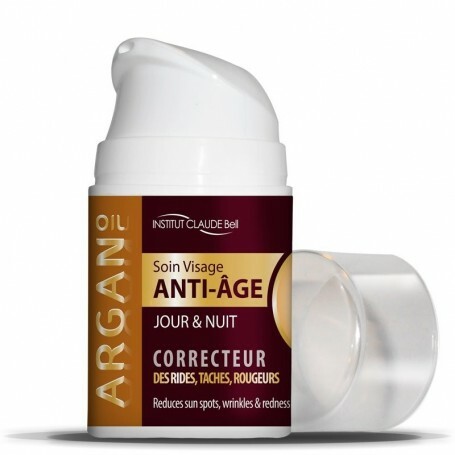 ARGAN OIL - ANTI-AGE - Anti-Aging Face Care - Day and night corrector of wrinkles, spots and redness. LESS TASKS - LESS WRINKLES - LESS REDS! Daily our skin undergoes aggressions jeopardizing its visible beauty: pollution, stress, UVA, chemicals ... The consequence of these aggressions is the premature aging with, dryness, loss of elasticity, dull appearance, Appearance of redness, brown spots and the formation of wrinkles. With a growing life expectancy and increasingly aggressive environment, it is necessary to adopt an overall anti-aging strategy of repair and especially prevention. ARGAN OIL enhances the elasticity of the skin. Rich in vitamin E, it is known for its anti-radical properties but also for its virtues nutritious to the unique potential. THE ACTIVE VENUCEANE (active from the thermus thermophilus culture, original element of the great depths of the sea of ​​the golf of California) slows the appearance of the signs of aging, wrinkles, spots and it regulates the imperfections of the skin in particular the rednesses. Clinical test performed over a period of 6 months on a panel of 54 people. 27 people with active ingredients and 27 people with placebo. The texture of the face treatment ARGAN OIL Anti-Aging, soft and light cream is quickly absorbed by the skin. ARGAN OIL ANTI-AGING is used in the morning, as a day cream. EVERY MORNING, THE SKIN IS FRESH AND FRESH, IT REMAINS BEAUTIFUL ALONG THE DAY!